REDWOOD CITY, Calif.--(BUSINESS WIRE)--From the floor of Gartner’s Data & Analytics Summit, Interana today introduced Interana V3 – the world’s most advanced platform for behavioral discovery and analysis. Combining unprecedented speed and scalability with unparalleled ease-of-use, Interana V3 enables an entirely new mode of data analysis in which non-technical users can interactively ask question after question, across massive data sets, in real time, in order to better understand the behavior and interactions of their customers, products, and operations. Based in Silicon Valley, and founded by the team that built the technology Facebook uses internally to understand the behavior of its 2.2 billion users, Interana provides the world’s most advanced platform for behavioral discovery and analysis. 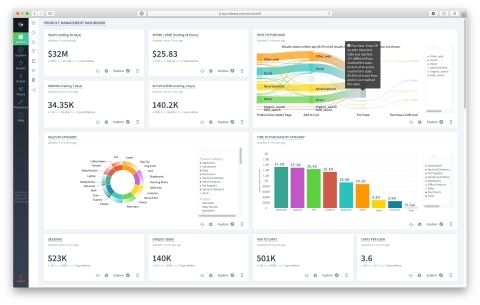 Used by companies such as Microsoft, Comcast, Goodyear, Uber, Sonos, Bleacher Report, and many others, Interana V3 is the only solution that allows business users to analyze trillions of data points, iteratively and in real time, to go beyond the static reports and dashboards of traditional BI and analytics tools, and surface business insights that would otherwise remain hidden. For more information, please visit us at www.interana.com, or on Facebook, Twitter, or LinkedIn as @InteranaCorp.